A gas well, seen in the upper left below the bike path, lies less than 200 feet from a Firestone, Colorado, home that exploded in late April, killing two. Investigators say the cause was a “fugitive gas leak” from an abandoned flow line that had been cut but not capped. On April 17, Mark Martinez and his brother-in-law Joey Irwin went down to the basement to replace a water heater in Martinez’s home in Firestone, Colorado, a fast-growing bedroom community 25 miles north of Denver. Moments later, a fiery explosion destroyed the house and shook the neighborhood. Both men were killed. Erin Martinez, Mark’s wife, and their son survived. Now, following a two-week investigation, the local fire department has linked the blast to a recently restarted gas well, drilled in 1993 and located just 178 feet behind the house and operated by Anadarko Petroleum Corp. A department statement said gas entered the house from a cut, abandoned flowline still connected to the well. 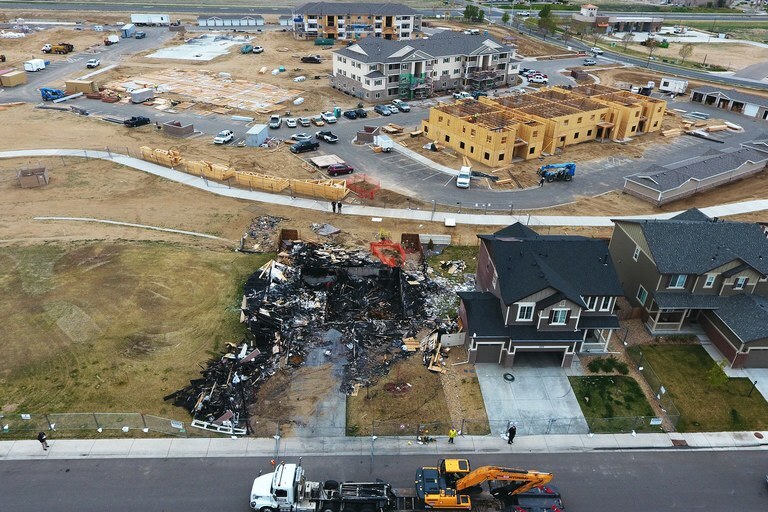 The fatal explosion has reignited the fierce debate over the pace and proximity of oil and gas development along Colorado’s Front Range, where booming energy fields have collided with a rapidly growing urban corridor. For years, environmentalists and community activists have furiously pushed to limit drilling near suburban Front Range communities, while the state government and industry leaders have resisted tougher restrictions. “I’ve been warning the state this was going to happen for years now,” says Shane Davis, a Boulder-based environmentalist who monitors state oil and gas data. Davis, nicknamed “the Fractivist,” gave a 2012 presentation to the Colorado Oil and Gas Conservation Commission arguing that state rules that determine safe distances between development and communities were inadequate to protect people from chemical fumes, wastewater spills or gas leaks. A year later, the commission decided to only modestly increase those setbacks. That and its lax monitoring of wells and pipelines are proof to Davis and others that regulators have downplayed risks—now with deadly results. Nearly half of Colorado’s 54,000 active oil and gas wells are in Weld County, which includes Firestone and is one of the nation's fastest growing counties. Wells number in the hundreds in neighboring Boulder and Adams counties, but drilling has expanded there in recent years as fracking technology and newer horizontal drilling techniques have made it possible to tap new reserves. The rise in drill rigs, truck traffic, and well pads in suburban communities — some operations just a few hundred feet from houses, schools, churches and playgrounds — sparked a backlash. Since 2012, several towns and counties have passed short-term moratoriums suspending drilling or fracking. Two cities attempted to ban fracking altogether, but industry lawsuits successfully struck down both bans for overstepping local authority. In 2014 and 2016, citizens’ groups even tried to force a statewide ballot initiative to outlaw fracking across the state. This region in North Thornton, Colorado, which includes homes, parks, an elementary school and Wal-Mart Supercenter, has numerous wells that were spudded or drilled between 1972 and 1991, indicated with orange markers. Slide back and forth to see development between 2001 and 2015. Data sources: COGCC, Google Earth. Image credit: Inside Energy/ Jordan Wirfs-Brock. In this area of western Greeley, well locations are indicated with orange markers. The state wells database has no information on when many were drilled. This could be because they are old enough that they pre-date accurate record-keeping. A few wells were drilled or spudded in 2009 as well. Slide back and forth to see development between 1999 and 2016. Data sources: COGCC, Google Earth. Image credit:Inside Energy/ Jordan Wirfs-Brock. In response, the Oil and Gas Commission reevaluated its rule that new wells in urban areas must be at least 350 feet from homes. Davis suggested a 2,500-foot setback. “I think increased threats of danger warranted increased safety precautions,” he explains. But the state’s revised rules in 2013 only marginally expanded urban setbacks to 500 feet from homes, and 1,000 feet from hospitals and schools. And those setbacks don’t apply when new houses encroach on existing oil and gas wells, creating a regulatory gap. Such “reverse setback” rules are instead determined by local governments and are generally less restrictive. So while oil and gas companies must comply with the 500 and 1,000-foot setbacks, developers in Weld County can build homes just 150 feet from existing wells. That’s how the Martinez home, built 18 months ago, ended up so close to the Anadarko well. Kirkmeyer and her fellow commissioners opposed even the minor 2013 setback changes, saying there was no evidence that greater distances would do more to protect public health and safety. This spring, Kirkmeyer also testified against state legislation that would have further extended setbacks from schools, helping to defeat the bill. Industry proponents point out that Colorado already has some of the country’s toughest restrictions on oil and gas development. Stricter setbacks—like Davis’ 2,500-foot proposal—are unwarranted, they have argued, and could effectively shut down drilling, costing Colorado hundreds of millions in lost tax dollars. Now, those arguments and other state regulations are being called into question. For instance, many flowlines, like the one linked to the explosion, are exempt from inspections and integrity tests if they operate at lower pressures. But those lines, which connect wells to production facilities, are sometimes just an inch in diameter and often made of plastic; they can crack due to weather or human disturbance. In Firestone, the deadly flowline was accidentally cut when an oil tank battery was relocated before the new subdivision was built. Exempting such lines from inspections allows tens of thousands of miles of underground lines to go unmonitored, says Davis. “The reason for the flowline pressure-testing exemptions is it’s just too difficult, time-consuming and costly to the state and industry,” he adds. The oil and gas commission’s roughly 20 field inspectors could hardly tackle the job. Spotty oversight is especially troublesome when dealing with older wells and infrastructure, says Wes Wilson, a one-time Environmental Protection Agency scientist turned whistleblower who now serves as the science advisor for the Colorado-based progressive group Be The Change. Despite many activists’ focus on newer, fracked wells, nearly 90 percent of Colorado’s active wells were drilled years ago, and there are another 36,000 abandoned or inactive wells that are scarcely monitored. According to research by Cornell University’s Anthony Ingraffea, roughly 60 percent of well casings fail after 25 years. (Industry disputes this figure.) Yet past state reviews to update policy, such as a 2014 task force, have failed to address either the consistency of inspections, or reverse setbacks. “The big story is we don’t trust the oil and gas commission,” says Wilson. Prior to the announcement of the findings from Firestone, Adams County commissioners had already asked all companies to halt production at wells within 250 feet of occupied buildings. Boulder County commissioners, who are considering how and if to extend a 5-year oil and gas moratorium that expired this month, are pushing for inspections of all of its 300 older wells. Now, governments may step up their demands and reconsider tougher local rules. The Colorado Sierra Club is calling for a halt to new oil and gas drilling, while Davis has started a petition to shut down all active wells in residential areas across the state. Anadarko also pledged to cooperate with the oil and gas commission and investigators. Even before authorities linked its well to the explosion, the company turned off all 3,000-plus of its older wells across northeast Colorado. “We hope that doing so also provided some additional reassurance to the community in the wake of this tragic accident,” Al Walker, Anadarko CEO and president, said in a statement. Note: this story has been updated to reflect the fact that it remains unclear who, exactly, was responsible for cutting the line.